The brace-faced, plaid-clad crew was out in force at Neumos on Feb. 25, but to my surprise the barriers separating bar from dance floor was left a larger drink-available region than I’ve ever seen at Neumos. That allocation of space and diversity of crowd was a true testament to the cross-generational appeal that genre-melding indie rock has gained. One of the first things I noticed while waiting for middle-slotted New Zealand outfit Cut Off Your Hands was a dreadlocked fan from the band’s first Seattle stop in support of We Are Scientists last July. After the group’s performance that night, he thanked each member personally as they exited the stage in a touchingly personal example of true appreciation. Though he didn’t get quite as involved this time around, he seemed to enjoy the show as much as the rest of the crowd. The kiwi quartet utilized strobe lights and fog machines to their complete advantage, and turned their danceable indie-rock into a total crowd pleaser. The one thing I failed to notice last time is that all four members are mic’d up for vocals — and they all contribute significantly — making the entire performance was really an exercise in sharing. Unsurprisingly, frontman Nick Johnston pulled many of his same stunts: tossing his microphone into the crowd, writhing around the dance floor, somersaulting over barriers. I have no idea how he didn’t break through the skin of his drum after beating it with the wrong end of his sticks, or break his neck from the wild positions he contorted into while writhing on the stage. When Ra Ra Riot took stage around 11 p.m., I remembered that, through no fault of my own, female musicians are intrinsically attractive. 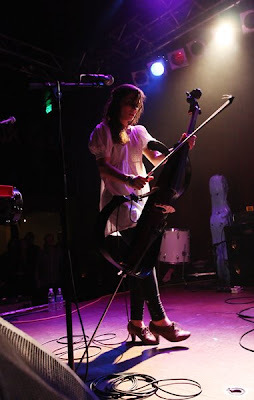 That being said, cellist Alexandra Lawn surpassed Flobots violist Mackenzie Roberts as my latest crush. She’s incredibly talented, along with violinist Rebecca Zeller, and was clearly classically trained before she switched to electric and traded in Rachmaninoff for Rock ‘n’ Roll. With six on the stage, Ra Ra Riot managed to maintain perfect stage flow and awareness not only of self but all the others. That really came through as evidence of their closeness, a bond developed from years together at college and the death of a band mate; John Pike, the group’s original drummer, drowned in June 2007. And though they attended Syracuse and mostly hail from the Northeast, signing to Seattle record label Barsuk made the Northwest their home away from home. 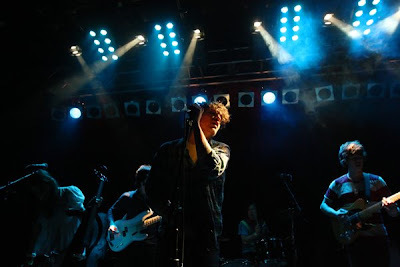 The sextet, who began generating buzz almost as soon as they formed and toured with the likes of Art Brut, Editors, Vampire Weekend and Los Campesions!, earned their headlining tours. It’s still amazing to hear how they can transform a cello-violin string duet into a rock song at the drop of a hat. Ra Ra Riot creates a true symphony of sound, a wave rising above the stage and crashing down on the audience. I caught myself starting to lose focus on the band itself and focus only on the music-inspired feeling. With the volume turned just a few notches below “eardrum-bursting,” my ears rang for hours after leaving the venue. The performance — and feeling of musical satisfaction — was well worth the cost.